Hey all, it seems the same compact retract thruster problem has occurred for us. I realise this is an old thread but I’d greatly appreciate guidance from the forum. The thruster is deployed down again (a technician did this, then said it was up!) and will neither retract or activate the thruster. I need to get it up to sail to the technician for repair again. I’ve nver used the thruster for more than 10s bursts, and it was working fine until it locked down, in manual mode. Can I get urgent help here - which or where are the white wires to cut? Are they in the command centre or the waterproof box? If it is a problem with the temp sensor the control will beep 3 times or so and then nothing happens. This season we had same issue. The white wire trick solved it. On the watertight box there are to the most left side 2 white wires. I could simply take one of the wires out of the pinout connector with a sharp object inserted into the connector. Take care that there are also a pair of gray wires. 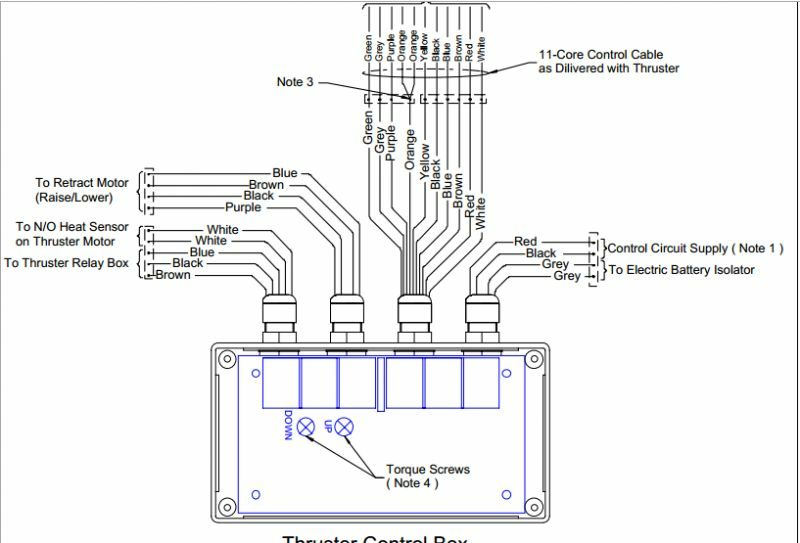 Download the right manual from max-power.com to see drawings if your uncertain. yes I’m getting the three beeps initially then steady beeping after at the control unit. Are the (numbered 1&2) 3mm white-plastic covered wires, far left heading with the thruster battery cables into the main motor unit, as you recall? Wish I could send a picture of course, will try a DM. Mayby it's another problem You have. When I had the temp sensor error it would make a long beep and would not turn on. I only have steady 5-10 sec beeps when the Thruster is deployed and ready. It was very hard to diagnose the problem because the Thruster was working 50% of the time. At different ambient temperatures and battery voltage, and water speeds below 3 kn. My problem was it would only turn on 50% of the times. And when using it for short bursts it would scream/long beep at me an retract itself. And sometimes it worked without any errors. But with the white wire trick it has be working without errors. Hi,you could check the power supply accu voltage is enough. I have a problem - we lost the detail, that covers our bow thruster. Did anyone had the same problem? Where can I buy it?